Today I accompanied James to the local canal in search of bream - trying to find my five pounder. And after stalking big bream in the clear water, where they cold see us coming a mile away we made our way down to some murky water for a bait and wait approach. And we didn't have to wait long before James landed a bream about 5½ pound, which went back unweighed and un-photographed - I wanted one! Next up I had a 4lb 9oz bream, a new PB and I'm getting closer to my target. Then the swim went dead. I thought I knew why and a shad was cast out to find the suspect, first cast a nice double nailed it, shook it's head in anger, spat the lure and sank back into the murky depths. After taking a moment to curse my luck I cast back out and she hit it again - cue the most spectacular arial fight! 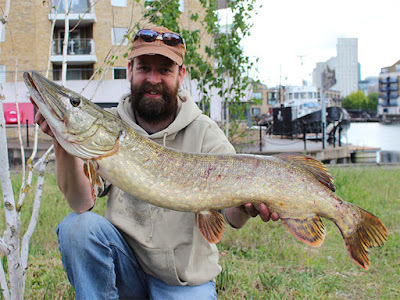 A tail walking 15lb 0oz pike was mine. 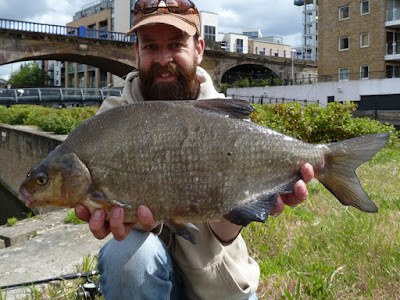 And every self respecting bream for miles had gone into hiding - no more bream today, but did I really care? Lovely fish there Brian, I had my first canal Pike yesterday, only 5lb 8oz but gave a great account for itself. I've never really been a fan of them but looking forward to targeting them on the river this year.